With WWE rumoured to be closing in on a massive TV deal for Monday Night Raw, you would think the company would try to improve the product and ratings for the show, but that didn't happen this week. The May 21 edition of Raw averaged 2.669 million viewers and was down 72,000 from last week's average of 2.741 million. The key segments for the show were Roman Reigns confronting Stephanie McMahon, Sami Zayn bringing out "Lashley's Sisters" and, the contract signing between Ronda Rousey and Raw Women's Champion Nia Jax. The biggest matches of the night were Reigns & Seth Rollins vs. Kevin Owens & Jinder Mahal, a fatal-four way qualifying match for the Women's Money in the Bank Ladder Match and the main event between Finn Balor and Braun Strowman. The NBA Conference Finals was the top program for the night, with the Cleveland Cavaliers beating the Boston Celtics 111 to 102 earning 7.775 million viewers for ESPN. Raw was number four in the ratings and lost 25,000 heading into the second hour, which began with the disastrous Lashley's Sisters segment. The third hour was considered by many to be the best part of the show, but the viewership still declined by 320,000. 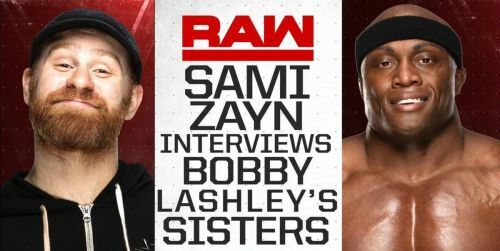 Many fans have already declared the segment with Bobby Lashley and Sami Zayn as the worst segment of 2018 and have compared it to "Bayley: This is Your Life" from the May 29, 2017 episode of Raw. Both shows are relatively close in viewership, but this week's Raw was up 56,000 viewers from last year's atrocity which averaged 2.613 million. Raw has already booked two matches for next week's show including Mahal vs Rollins for the Intercontinental Championship, and the last qualifying match for the Women's Money in the Bank Ladder Match. WWE are making more money than ever before, but it goes without saying that their television is in need of a massive overhaul.